23 million of us watched with a touch of sadness as the Olympic Flame was extinguished on Sunday night. As the flame died away, a giant Phoenix rose above the cauldron almost asking the question of what legacy will rise from the ashes of this great event. Of course, there has been much coverage of how the Olympics will leave a sporting legacy for the United Kingdom but what of its collecting legacy? In January 1999 an event changed the coin collecting market forever – in the United States the first State Quarter was issued. It marked the beginning of a 50 coin programme that placed a quarter for every US State into circulation. Average annual quarter mintages reached 3.5 billion pieces – 135% more than the previous average pointing to the vast numbers of coins being collected out of circulation. The legacy has been at the heart of a revitalised United States numismatic market that continues to see new mintages – often as high as 500,000 – repeatedly oversubscribed and a continued strengthening of the secondary market. The Olympics has provided the UK with its own State Quarter moment through the 29 Olympic Sports 50 pence coins, which have been released into circulation. Not even the Royal Mint would suggest that the Olympic 50p coins have had the same impact as the US State Quarters but over the weeks leading up to and during the Games, they have seen increasing popular interest amongst the man, woman and child on the street. The Royal Mint 50p Collection. Previously few people took more than a passing glimpse at their change (even though a number of different £2, £1 and 50p designs exist) but suddenly you see children begging parents of “that 50p”; waitresses wanting to swap the coins in their tips; people turning to social media to requests swaps of their duplicated coins. The collecting fever that so often has been seen in the playgrounds of the country for Pokemon cards or Panini World Cup stickers is being repeated across the country, not just amongst kids but by adults of all ages. 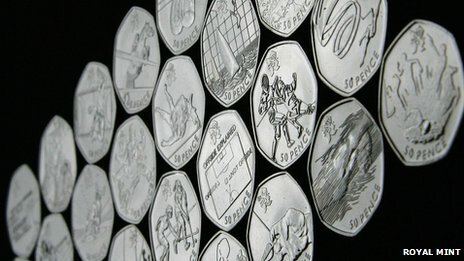 With the success of the Games, the upcoming Paralympic frenzy and the increasing rarity of the circulating Olympic 50 pence coins, the collecting fervour of the British nation looks set to continue. If the 50 pence series started to capture a nation in the lead up to the Games, nothing compares to the excitement that Royal Mail’s Olympic offering has provided. The stamp that got Kat Copeland & Sophie Hosking so excited straight after winning gold. When almost the first thing an Olympian says on winning a gold medal is “We’re going to be on a stamp tomorrow”, you know that Royal Mail’s decision to issue Gold Medal winners stamps is a good one. Well that is exactly what Kat Copeland said to her Double Skulls partner, Sophie Hosking just moments after completing their epic Gold Medal winning competition. And what a collection of stamps Royal Mail has gone on to produce, featuring all 29 Gold Medals and 42 Olympians, in a massive logistical feat each stamp was available the very next day from 500 Post Offices across the country. Royal Mail successfully engaged a nation, with athletes being presented with blow ups of their stamps during TV interviews and the national newspapers providing consistent coverage. The result has been a series of stamps that has seen more interest from the public than anything else since the very first stamps of Queen Elizabeth II – something that is beyond most of the population’s living memory. So what of the legacy? The Games have created thousands of new collectors. Some will stop but many others will continue. Some already are, choosing to select some of the more limited edition coins and stamps available to celebrate the Games. Whatever their choice, those people who have stepped into the world of coins or stamps, perhaps for the first time, own a collectable for the future. In years to come, children and grandchildren will look, touch and feel that moment when Great Britain held the Olympic Games. It will be the closest they get to being able to share the sense of achievement we have all felt over the last two weeks – a true sense of Great Britishness. As such they create the sort of emotional value that so often forms the basis of a longer term physical value. Today’s mementos of a magnificent Games will represent a moment of history for future generations. By the time Britain hosts the Games again these will be the stuff of the Antiques Roadshow. A Legacy for sport – we all hope so. A Legacy for collecting – without doubt. I have loved collecting 50ps for 2 years. I was told by my daughter about them as she read an article in a magazine ! I had always looked out for commemorative 50ps before. I saw this as a challenge for 2 years to culminate( I hoped ) before the end of olympics.I still need 6 coins and have started trying to swap on line. I only discovered the website in August and naiively thought I was alone in my mission as anyone I ever asked said they did not even know they were in existence.! I rarely get envelopes in post with nice stamps on these days so for me it has to be coins all the way. The stamps are attractive but i would have to go out and purchase them to see them. The coins just turn up in my palm! Thank you for your comment. I do hope you manage to complete your collection soon. I was wondering whether you’ve had any success with our online 50p Swap Centre yet? Literally within a few hours of writing, Royal Mail has confirmed that the Gold Medal Winners Stamps have been so popular that they will be releasing an individual Gold Medal Winner Stamp for each Paralympian gold medallist. Previously they had planned just 6 Paralympian Gold Medal Stamps.